Stephen is a cameraman and producer and runs a small company called Eucalypt Productions. His recent telemark ski film Winter Dreaming has won him high praise and excellent reviews. His current filming project is on a skiing expedition to Kamchatka in far eastern Russia. I presently live in Harrietville near Mt Hotham. My other homes or perhaps more accurately, my bases have included Bogong Village, Mt Beauty, Dinner Plain and Tawonga South. Although I had been walking and skiing in the Alps since 1989, I actually moved here with little prompting in 2000 to make the most of my teaching degree by actually using it! I worked at the Bogong Outdoor Education Centre for four years before moving to the Blue Mountains for five years. However, my connection to the Alps was not lost as from winter 2005 I began production on a film, Winter Dreaming until 2008. Living and working in a happy, healthy natural environment have been the draw cards to living in the Alps and Blue Mountains over the last ten-odd years. Most recently I’ve completed a year ‘s teaching at the Alpine School in Dinner Plain, a deeply enriching experience. Each term, 45 year-9 students from various government schools apply to live as a remote community to undertake various leadership, personal development and outdoor activities. Like the students, my own learning has blossomed and been cemented with positive experiences relating to Indigenous Australians, instilling hope and encouragement within ourselves so that we create happy, healthy and innovative communities. The collective upshot of all this is the development of my next chapter: a move to the Southern Highlands south of Sydney. The coast is nearby which is important from a surfing perspective, while an array of canyons and cliff litter the sandstone escarpment. My vocation continues but with the addition of a new location. I’ll never lose my connection to the Alps. Guaranteed, you will find me in the snowgums somewhere and skiing with a rather large grin. A few stand out. Mt Bogong’s allure in winter is mesmerising. Post-storm, two friends and I slinked through snowy freshness down the Staircase Spur near sunset. As majestic dark cloud ebbed deep in the valleys, Mt Bogong’s northern slopes were ablaze with fiery orange. Sub-zero, the intensity of cold combined with the purity of colour produced an addictive, dream-like state. It’s an experience buzzes the body and soul with complete goodness. Film work in Antarctica has been a life highlight, especially Wilhelmina Bay. Crabeater and Leopard seals, Humpbacks and an active ice-pack were constant companions over 10 weeks. More Antarctic projects are planned. South Georgia Island, which has been described as a bit of Switzerland dropped in the Southern Ocean, is similarly mesmerising. The fragrance of animal guano is a small price to pay for the extraordinary display of wildlife as soaring peaks tower over literally a plethora of wildlife – vibrant King Penguin rookeries, the effortless flight of the Wandering Albatross, or Giant Petrels performing their ritualistic mating game. Many more warrant further story-telling, including vast tracts of Tasmania’s South West wilderness. What began with a natural curiosity to explore natural, remote places beginning some 20 years ago has evolved to capturing the beauty of such places and the journeys through them on camera and in words. I’m clear that I’m very lucky to travel and make a living from such pursuits. For me it’s about ongoing education to the masses to strengthen our understanding and vital connection to the natural world. Practically, that means I teach, photograph, write and make films. In most recent times, the promotion of the natural environment’s health has been in measure with promoting the happiness and health of specific communities such as in mountain art festivals, Antarctic tourism and conservation and in outdoor education/recreation in Victorian and NSW schools and tertiary institutions. Increasingly, there’s a chord being struck with how indigenous people have forged their connections with the land and what Westerners can learn and apply from those indigenous connections. My aim with nature and adventure film-making is to capture the rawness and spontaneity (aka capturing the almost unbelievable or ‘the moment’) of wildlife and wild landscape’s natural processes (think breaching whales, active volcanoes, avalanches, epic storms) especially in cold, alpine and extreme natural environments. Eternally grateful for my family and friends, past and present, for instilling a sense of love, integrity, pride. Dearest Dad for expressing: ‘you can only do your best’. 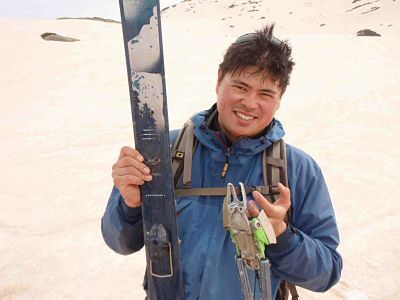 My introduction to the outdoors through bushwalking without doubt has dominated much of my life; this has mushroomed into other fun, healthy pursuits – telemark skiing, skate skiing, canyoning, surfing, trekking – all of which are essentially relying upon your own skills and devices to travel the world’s fantastic natural landscapes. Seeing life from a different perspective – instilled from Mum and Dad – has been the backbone of my outlook on life. Outdoor pursuits have been my meditation and reflection tools for many years but experiencing the same through restorative conversations with specific individuals have had a massive positive affect too. The passing of my Dad several years was profound but so too the process of grieving, and eventually, healing has made me compassionate, energised and happy. A friend, Deb, was tragically hit and killed by a drunk driver as she rode her bike through Wangaratta while we were in our early 20s. Life was indeed short and to be lived each day. It was sobering. The simple things. Seeing snow fall, especially in the Australian Alps but it could be anywhere in the world. The feel and movement of telemark skiing. While it’s challenging at times, when all the factors sync – your ski buddies are beside you, you’ve fluked the right stance – the telemark skiing experience is sublime. That feeling is just as good as surfing. Floating above the emerald-green ocean, surfing cleanses and re-energises. Hanging with extremely good, grounded people who can laugh. Why would you wish otherwise? Seeing the potential in people, especially young ones, as they learn to listen to, then act on, their own greatness within. My family members – all working at ‘the coal face’, loving and supportive. Dalai Lama – positive in the face of adversity. Kasonde Taylor – outdoor educator, Journey practitioner and all-round legend whose educative work improves the health of Australia’s natural landscape and its indigenous people. Yvon Chouinard – founder of Patagonia, outdoor clothing and gear company. Yvon is a surfer, skier, climber and fly-fisherman. Yvon, would you like to be adopt me as an honorary step-son? Patagonia’s mission statement: build the best product, cause no unnecessary harm, use business to inspire and implement solutions to the environmental crisis. Since 1985, the company has donated over US$20 million to grassroots efforts that includes the restoration and conservation of the natural environment through One percent For The Planet. The company has an incredibly progressive, innovative work philosophy based on sustainability and fun that all workplaces could learn from. Countless grounded friends, often met through music and the outdoors, who all possess a certain authenticity and make me appreciate that life is magic and that we all have the ability to make a difference—if we choose to. Seeing (young) people letting it all hang out, laugh, being silly, warts and all. People overcoming their everyday challenges, harnessing the courage to express how it is for them. People being themselves. Seeing my nephews and niece playing and being cheeky. A fresh snowstorm and the glimmering alpine landscape in its wake. Icicles clink and radiate iridescently from snowgum leaves. whereabouts on the optimist – pessimist spectrum do you put yourself when it comes to the future of our society and planet? High on the scale towards optimism. Like a challenging ski tour or hard slog off-track, just keep moving – even if it’s at a snail’s pace. ‘If you stop, you wither’ rings true with ‘if you don’t use it, you lose it’. It’s important to keep an active mind and body, no matter the pursuit in life. This is not to say we don’t take time out for ourselves but not to the extent of too much navel-gazing. I find that a balance is required between thinking/reflection and action. All humans are beautiful and offer an infinite amount of energy, positivity towards a sustainable society and planet – we all have a part to play, even if it’s ‘half a baby’ step a day. Yes, we take two steps back and one forward on some days but it’s important to just keep moving – even if it’s at a snail’s pace.